Goodbye (and hello) Reviewed by Edgeville Buzz on October 31, 2008 . Edgewater is losing a Berwyn corridor retail staple according to a note on the window of florist Blue Hydrangea. The store will be closed on November 1st as the owner is changing professions. 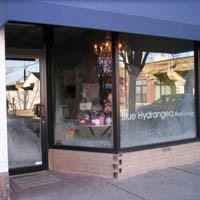 While many will miss our friends at Blue Hydrangea, there is currently a “For Rent” sign in the window leaving us wondering what may go in its place. A small brunch place would be great, do any of our readers have suggestions? Meanwhile the neighboring Steep Theatre looks to be near completion.